On October 15th Christian Carlbaum, together with the evaluation team from the Institute of Development Studies, presented on the finalised three year evaluation of Sweden’s Civil Society Strategy 2010–2014. The purpose of the evaluation was to find out if, how and why/why not the support via the Swedish CSOs through their national partners has contributed to the overall objectives of the strategy to create conditions to enable poor and discriminated people to improve their living conditions and quality of life. 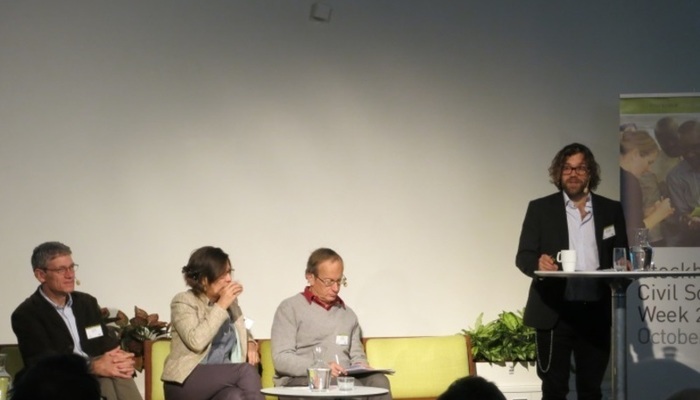 Sida and the Swedish Ministry for Foreign Affairs organised the Stockholm Civil Society Week held at Sida’s Headquarters with many attendees from CSOs, donors and experts from around the world. The presentation of the evaluation was therefore provided with a great platform for the presentation of the findings and recommendations and the whole day was dedicated to learning from evaluations of support to CSOs. We are excited that after a very interesting and challenging journey people from the civil society, Sida, the Swedish MFA and other donors see the outcome of our work as relevant and important. The findings and recommendations from the final report are already being included in the on-going development of the new CS Strategy. We also learned that the evaluation is being fed into DFID’s current review of their civil society work.